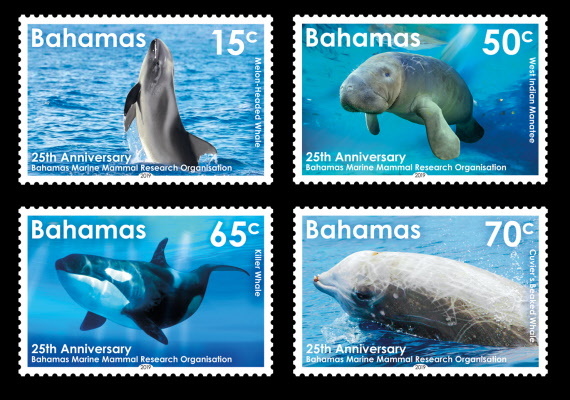 The Bahamas Marine Mammal Research Organisation (BMMRO) is a Bahamian non-profit organisation whose mission is to promote the conservation of marine mammals in The Bahamas through scientific research and educational outreach. Since 1991, BMMRO has been conducting boat surveys primarily around Abaco Island to document the occurrence, distribution and abundance of marine mammals in The Bahamas. The majority of species found here are deep-diving toothed whales that inhabit the pelagic waters surrounding the shallow Bahama banks. Some migrate through The Bahamas, but many species are year-round residents, including some of the world’s least known whales. By photographing the pattern of natural nicks and scars on each animal’s dorsal fin or tail flukes, a technique known as photo-identification, we keep track of individuals over time – gaining an understanding of their population demographics, reproductive success, and social structure. BMMRO’s field work has expanded over the past ten years to include surveys in the Great Bahama Canyon, including at the US Navy’s Atlantic Test and Evaluation Center in Tongue of the Ocean, where use of tactical sonars potentially pose a risk for some species. This work has provided a wider picture of marine mammal distribution in the northern Bahamas and has aided in identifying important areas for deep-diving whales. Genetic studies and pollutant analyses have helped to identify stocks and will allow further investigation of the health of local populations. Through on-going partnerships with universities and oceanographic institutes, BMMRO has many new projects underway including the use of hexacopters to photograph whales to assess their health. 15c Melon-headed whales (Peponocephala electra) are found in tropical waters and are relatively small dolphins growing up to 10 feet maximum in length. They have a fairly large falcate dorsal fin in the centre of the back, and have round heads, lacking a beak like many dolphins. Their body is black in colour, with a dark grey cape and striking white lips. Melon-headed whales are found in groups ranging from 50 – 500 whales! Groups frequent the deep waters of the Bahamas and are particularly common in Tongue of the Ocean where they feed on squid. Tagging data revealed that they only feed at night time and spend their days resting, socialising and travelling. Using the unique pattern of nicks in their dorsal fin, BMMRO can keep track of this oceanic dolphin and has re-sighted the same individuals over multiple years. 50c West Indian manatee (Trichechus manatus) are found in bays, harbours and mangrove creeks throughout the Bahamas, although the population is very small. As populations in Florida have increased in recent years, some manatees have emigrated to the Bahamas where our population has grown from a few animals to around 20-25 manatees. Reproductive females are finding mates and calving in our waters. They are rotund animals with small heads and small flippers that have fingernails at the tip, and a large paddle-shaped tail. They are greyish in colour but are often covered in patches of algae which can give them a green or red tinge. Manatees can grow up to 12 feet in length and weigh up to 3,500 pounds. These animals are coastal, except when they are migrating between islands. They feed solely on marine vegetation (seagrasses, algae) which are plentiful in the Bahamas. Manatees also need to find fresh water to drink every 10 days or so. Since fresh water is a limiting resource in the Bahamas, people want to give water from a hose but by providing water at docks, we are increasing the chances of a boat strike which can be fatal. Tagging studies carried out by BMMRO have shown that manatees are capable of finding water sources on their own so help to keep Bahamian manatees healthy – do not feed or provide water, just enjoy these gentle giants. 65c Killer whales (Orcinus orca) are found in all the world’s oceans, including tropical waters like the Bahamas, but they are more abundant in colder waters. Killer whales are the largest member of the dolphin family; females can grow up to 25 feet long, and males almost 30 feet long. They are easily identifiable by their distinct white eye patch and tall dorsal fins. Killer whales transiting through the Bahamas have been seen feeding on other marine mammal species, including dwarf and pygmy sperm whales, Atlantic spotted dolphins, and Frasers’ dolphins. Using their unique pattern of natural marking, we have re-sighted some of the same individual killer whales in the Bahamas more than eight times, over a period of two decades. 70c Cuvier’s beaked whales (Ziphius cavirostris) are found in all the world’s oceans. These medium-sized whales reach 21 feet in length, and are brownish-grey in colour. They have a small dorsal fin found almost two thirds of the way back along their body and a short undefined snout. This species has only two teeth located at the tip of the lower jaw and only erupt above the gum line in males, but not until they become sexually mature. Older whales have numerous white oval scars caused by cookie cutter sharks and linear scars caused by being scratched by the teeth of their male con-specifics. Older males have a white head from overlapping scars from numerous territorial battles with other males. Each whale’s unique scarring pattern has allowed BMMRO to track individuals over decades and suggests that they may be year-round residents in our waters. Tagging data has shown that these whales are feeding at depths over 6,000 feet!